We have Davie Crockett, Daniel Boone, Lewis and Clark & other Frontiersmen, Pioneers & Mountain Men Costumes for Adults and Children. Basically, we have any & every Child Historical Costume, Children’s Quality Period Attire & School Project Costumes you can imagine. Get Real Vintage Attire and 60’s-70’s Vintage Gunny Sack Dresses for Frontier & Blackland Prairie Festival Costumes like the ones shown here. We have the perfect Vintage Dresses for ‘Oklahoma’ Musical Costume Attire, Vintage Hippie Girl Gunny Sack Dresses, Vintage Gunny Sack Prairie Dresses, Vintage Gunny Sack Dress for the perfect Hillbilly Costumes, Ladies Vintage Gunny Sack Dresses for Period Costumes, ‘Texas’ Musical Drama Prairie Dresses and Historical Frontier Women’s Outfits. We have True Vintage Attire and even more Vintage Reproduction Clothing because we need the larger sizes and larger quantities of Outfits for the huge number of Costumes we provide for Theatrical, Film and Theme Party Events. Nobody in the Dallas or North Texas Area has more Prairie or Frontier Period Attire than Dallas Vintage Shop. We are open all rear round to serve. We have excellent costumes for Lewis & Clark, Early American Explorers and Important American Frontiersmen. 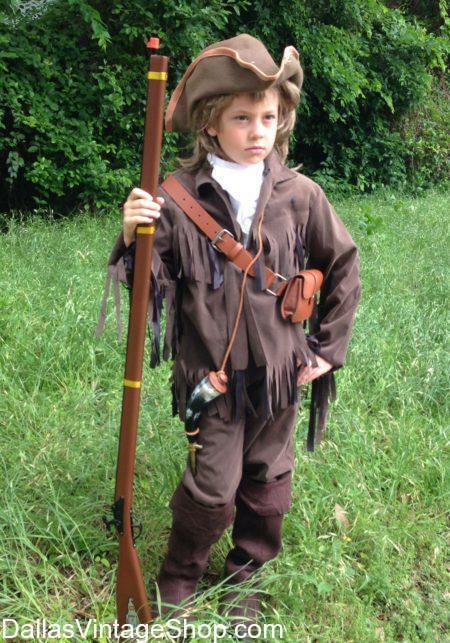 This Meriwether Lewis, Famous US Explorers & Frontiersmen Costume is just a sample of the Child Frontiersmen School Historical Project costumes we have in stock. We have all the Frontiersmen clothing and costumes you need for any famous American Explorers or Pioneers. From Lewis & Clark to Fur Trappers & Traders, from the California Gold Rush to Wild West Frontiersmen, we have the Period Costumes you need. You will find Super High Quality suede, leather & fur clothing and outerwear to suede cloth and faux fur & faux leather costumes for kids historical frontiersmen school projects or Halloween & theme party costumes. We have prop Frontiersmen weapons, belts, pelts, powder horns, boots & boot covers, tricorn & fur hats and even wigs, beards and makeup if you need it. We have volumes of Adult & Children’s Historic Americans Costumes. This Sacagawea, American Indian Costume is perfect for School Projects. This Historical Character was the Indian Guide for The Lewis & Clark Expedition. Whatever famous American you need a costume for Dallas Vintage Shop is the right place to find it. We have economy Native American Indian Costumes for girls & boys, men & ladies. We have Indian clothing, dresses, boys sets, headbands war bonnets, jewelry & chokers, wigs and so much more. But if you want to go all out for better quality of celebrity quality, we have quantities of impressive choices. The Wild American Frontier brings along its own collection of characters from fur traders to explorers, trailblazers, mercenaries, hired guns, outlaws and renegades. Davy Crockett, Lewis and Clark, Wild Bill, Annie Oakley, etc. You are in Frontiersmen & Women category.